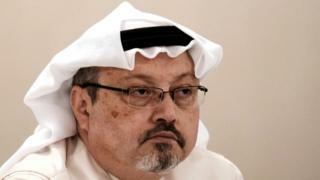 The trial of 11 individuals over the murder of Saudi journalist Jamal Khashoggi has begun in the Saudi capital, Riyadh, state media report. Prosecutors have asked for the death penalty for five of the defendants. Prosecutors say he was murdered in a “rogue” operation by agents sent to persuade him to return to the kingdom. What do we know of the trial? Requests to Turkey for evidence had not yet been answered, the attorney general said in a statement carried on the Saudi Press Agency. No names of the defendants have been officially released. Earlier statements said another 10 people were also being investigated. What have the Saudis said so far? In November, Deputy Public Prosecutor Shalaan bin Rajih Shalaan said investigators had concluded that an intelligence officer ordered Khashoggi’s murder, applying a lethal injection inside the consulate. The remains have not yet been found. Are there any clues about the defendants’ identities? Turkey has identified 15 men it believes to be Saudi agents arriving at and departing from Istanbul’s international airport around the time of the killing. But whether any of them are now on trial in Riyadh is unknown. One man who will not be on trial is Crown Prince Mohammed bin Salman, the son of King Salman and Saudi Arabia’s de facto ruler, who has been accused by some in the West of being behind the killing. Prince Mohammed has denied any role in what he has called a “heinous crime that cannot be justified”. The US has imposed sanctions on 17 Saudi officials, including Saud al-Qahtani, a former adviser to the crown prince who it alleged was “part of the planning and execution of the operation” that led to Khashoggi’s murder. Again, it is unclear if any of the 17 are being tried. Will it tell us the whole story? The key question a lot of people will be asking about this trial is: Will it tell us the whole story about how Khashoggi died? The past history of previous trials in Saudi Arabia would tend to indicate that it won’t. Commenting on the first day of the trial today, Amnesty International said “Saudi Arabia’s criminal justice system falls far short of international law”. The human rights group, which has called for a UN investigation into the journalist’s murder, added that “the impartiality of any investigation by the Saudi authorities is inevitably highly questionable”. The Saudi authorities have previously defended their justice system saying it is based on Sharia (Islamic law) and that therefore it is above criticism. But Saudi trials are notoriously opaque and due to the absence of a standard criminal code judges are often given leeway to hand out arbitrary punishments. But he fell out of favour and went into self-imposed exile in the US last year. From there, he wrote columns for the Washington Post in which he criticised the policies of the crown prince. In his first column for the newspaper, Khashoggi said he feared being arrested in an apparent crackdown on dissent overseen by the prince. In his last column, he criticised Saudi involvement in war in Yemen.